I’ve attended Robert McKee‘s seminars at least 4 times (if memory serves me) and I’ve enjoyed it thoroughly on every occasion. I was always there with a project under my arm, confronting his ideas with mine, using McKee’s wisdom as both my ally and my critic. At some stage his Story seminar became a book named “Story: Substance, Structure, Style, and the Principles of Screenwriting” (McKee must get paid by the S). The thickest screenwriting book ever, Story is a perfect companion, but please attend his seminar. Watching the man on stage is part of the magic. “STORY is about principles, not rules. is about eternal, universal forms, not formulas. In my humble opinion, if you manage to grasp the full meaning of these six lines you have a big chance of becoming a screenwriter. Read those pages carefully, as the soul of this important book is all there. Being a 400+ page work, please allow me to jump between what I feel are its main concepts. But that’s my view. Then, read the book. 4/ “A SCENE is an action through conflict in more or less continuous time and space that turns the value-charged condition of a character’s life on at least one value with a degree of perceptible significance. Ideally, every scene is an STORY EVENT.” I’ll be brave and disagree here with the master. I think the Sequence is the unit for narrative. The Scene is the unit for the 1st AD – the organiser of the actual filming – because it’s a unit of time and place, so any given scene will be shot in one go in the same place. But it may or may not be a unit of content. An example: Scene 1, I walk the street, Scene 2, I take the stairs, Scene 3, I get home. These are 3 different scenes, but they are saying only one thing or maybe not even that, maybe Scene 4 shows a corpse in my tub…. And Scene 5 shows me seeing it and happy to have it there! In this case, the 5 scenes are saying only one thing: this guy that looks perfectly ordinary has a dead body in his tub and is OK about it! So in this case it would be 5 scenes, but only 1 sequence; 5 pieces, 1 meaning. As far as narrative goes, the Sequence is what really counts. Allow me now to skip the “Archplot, Miniplot, Antiplot” section. Not the most practical part and for a while I had nightmares where I was chased by Archplots and Antiplots. Scary. So, with your permission, I’ll land on STRUCTURE AND SETTINGS (Note: In a way McKee adds an extra layer to William Goldman’s classic line SCREENPLAYS ARE STRUCTURE. As in Field, his best work is on Structure). “3. THE WAR ON CLICHÉ”. A battle I would volunteer for any time. “The source of all clichés can be traced to one thing and one thing alone. The writer does not know the world of his story.” Bigger truth was never told. So, lazy screenwriters of the world, be warned, cliché will kill your work, and that’s a fact. You shall RESEARCH and KNOW THE WORLD you are writing about: this is what McKee basically says in this section. You’d better, I’m serious. 1/ “TRUE CHARACTER is revealed in the choices a human being makes under pressure – the greater the pressure, the deeper the revelation, the truer the choice to the character’s essential nature”. 2/ “CHARACTER ARC: The finest writing not only reveals true character, but arcs or changes that inner nature, for better or worse, over the course of the telling”. 3/ “STRUCTURE AND CHARACTER FUNCTIONS: The function of STRUCTURE is to provide progressively building pressures that force characters into more and more difficult dilemmas where they must make more and more difficult risk-taking choices and actions, gradually revealing their true nature”. And a couple of notes on the story climax worth taking into consideration: “A revered Hollywood axiom warns: ‘Movies are about the last twenty minutes'” and “Thou Shall Save The Best For Last”. I know, you heard it one thousand times before, but it’s still a Big Truth. One of the most relevant contributions of this book is about Theme or, as McKee puts it, the CONTROLLING IDEA. “The Controlling Idea of a completed story must be expressible in a single sentence”. Wow. That’s a daring thing to say. In that same field, McKee refers a conversation with renowned screenwriter Paddy Chayefsky (please watch Network and learn) where he “told me that when he finally discovered his story’s meaning, he would scratch it out on a scrap of paper and tape it to his typewriter, so that nothing going through the machine wouldn’t in one way or another express his central theme”. That is a line that screenwriters should carve in his body. So full of meaning and so simple at the same time. FIND OUT what your story is about and STICK TO IT till the very end. You have to, if you want to succeed. (Note: This must be the only text by McKee that I have so far reproduced that wasn’t stressed in a bold font in the original book. I would dare suggesting Mr. McKee to please do so in his next edition! Excuse my boldness – never better said). According to McKee, THE PROTAGONIST is a willful character who has a conscious desire, that may also have a self-contradictory unconscious desire and must have at least a chance to attain his desire and the will and capacity to pursue it to the end of the line. Oh, and he must be empathic, of course. Chew it and swallow it, but take your time. Another notion I love from McKee: it has to exist always a GAP between expectation and result. I’d dare say that this works too for all aspects of the script. If our story is about a first-class football team that is going to play a very weak side, and then it wins easily, what’s the use? They’d better lose, or suffer a lot to win, or decide to lose the game, or the game never takes place because Martians land on the pitch … Something! Keep the gap between expectation and result. At all times. 1/ “The Inciting Incident in the Central Plot must happen on screen”. 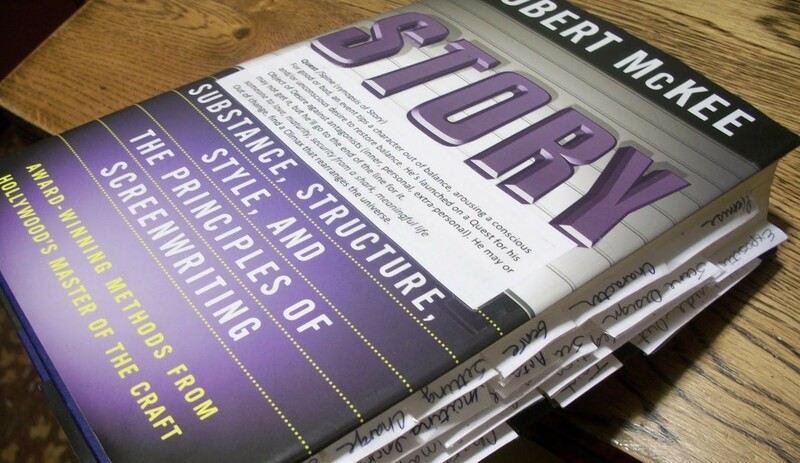 This entry was posted in BOOKS on screenwriting, SCREENWRITING and tagged Robert McKee, Story: Substance structure style and the principles of screenwriting. Bookmark the permalink.